Community Associations Institute (CAI) announced today that on Friday, July 29 President Barack Obama signed H.R. 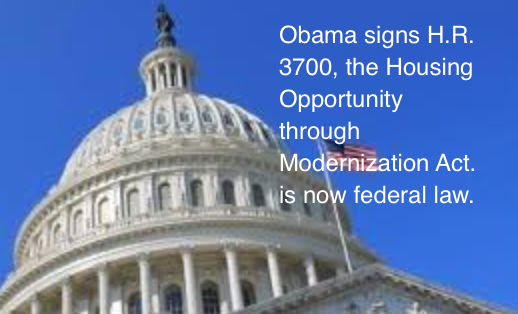 3700, the Housing Opportunity through Modernization Act. H.R. 3700 is now federal law. CAI reports that H.R. 3700 reforms the process used by the Federal Housing Administration (FHA) to determine if condominium unit owners qualify for a mortgage with FHA insurance. FHA does not originate mortgage loans, but instead insures mortgages against default.